Virus, Malware, Spyware, Adware Removal Specialists. At CTS, We take great care to ensure we remove all remnants of a Virus, Malware or Spyware. We also clean out all temp, cache, cookie folders. We carefully review you computers program list and remove commonly associated malicious programs and toolbars. We then go through the computers registry and program folders to ensure the remnants are removed there as well. We will repair the computers registry as well. It is really important to understand that catching viruses or Malware early makes our job much easier and the damage to your computer software much less likely. Rootkits and Trojans can easily take control of your computer functions and stop access to programs, the internet and Windows services on your computer. Be advised at times a computer might be to far gone and non recoverable and the best resolution is to copy files, scan them and reload the operating system. Viruses associate with good software files and are sometime removed during the clean up process. These files could be essential Windows operating files needed to run the Windows operating systems or other essential programs on your computer. At this time it is suggested that all files be copied and scanned before being reloaded on a freshly formatted and reloaded computer. Please note that all antivirus programs are designed to be preventative in nature and to catch viruses while they happen. Ordering an antivirus program in most cases will not remove a currently embedded malware, spyware, adware, virus or rootkit. Once a virus, malware or spyware or rootkit has taken hold of your computer and has embedded its malicious code or activity the antivirus program may not be able to resolve the problem by itself. The source of the problem must be detected and removed first prior to running antivirus or malware programs. Many times the source file is embedded in System Start up, Registry or Program folders. Each active process is unique and embedded in a different manner. Our staff has worked on many of these programs and understand the nature in which the code is developed. VERY VERY IMPORTANT – Some Virus, Malware, Spyware programs will download into your computer and immediately appear and inform you that your computer is infected. The programs look really real but these programs are know as fake alert or Ransomware programs and are designed to scare you into buying the solution. If the program does appear do not close the program. Immediately press CTRL -ALT- Delete and go to task manager – Select the task and hit end process. You may have to hold it down and another box may appear and show End Now. Hold the button down and the program should stop. There are many common variations of programs such as Trojan Rootkits, Malware, Spyware or Adware and are designed to wreak havoc on your computer. Beware of programs that pop up while browsing the internet and make you believe you have a problem with your computer; these companies make you beleieve that they have the solution to repair your computer and will ask for your money, cashiers check or credit card information. Do Not Order from these sites or programs. It is a scam. If you have done so immediately call your credit card company and inform them of the fraudulent transaction and ask for a stop payment of funds. In browsers such as Google Chrome, Internet Explorer and Mozilla Firefox. Every browser has an add on section which tells the browser what search provider to use. The default search provider in Internet Explorer is “Bing”. In Google Chrome it is “Google” and in Yahoo it uses its own search engine “Yahoo”. Malware, Adware and Spyware can change your search provider to another malicious search provider; in turn these malicious add-ons provide bad results on the search page which once opened can start the loading of malicious software on your computer even without your knowledge. A rootkit is a stealthy type of software, a malicious executable program designed to hide the existence of certain processes or programs from normal methods of detection and enable access to your computer for malicious means. The term rootkit is a concatenation of “root” (the traditional name of the privileged account in an operating systems) and the word “kit” (which refers to the software components that implement the executable program designed to cause the damage). The term “rootkit” has negative connotations through its association with malware, spyware or adware. Rootkit installation can be automated, or an attacker can install it once they’ve obtained root access to your computer even without your knowledge. Obtaining this access is a result of direct attack on an operating system (i.e. ), exploiting a previous vulnerability. Once installed, it becomes possible to hide the intrusion as well as to maintain privileged access to your computer software, services, etc… The root program is much like a weed in a garden. In order to get rid of the problem the root and weed need to be removed. Programs can remove the weed but not the root. The root is an executable program that will reload the program again on rebooting your computer. Malware, Spyware and adware can obtain full control over a system means that existing software can be modified, including software that might otherwise be used to detect or circumvent it. Rootkit detection is difficult because a rootkit may be able to subvert the software that is intended to find it. Detection methods include using an alternative and trusted operating system, behavioral-based methods, signature scanning, difference scanning, and memory dump analysis. Removal can be complicated or practically impossible, especially in cases where the rootkit resides in the kernel; reinstallation of the operating system may be the only available solution to the problem. When dealing with firmware rootkits, removal may sometimes require hardware replacement, or specialized programs. A computer virus is a program that can copy itself and infect a computer. The term “virus” is also commonly but erroneously used to refer to other types of malware, including but not limited to adware and spyware programs that do not have the reproductive ability. A true virus can spread from one computer to another when its host is taken to the target computer; for instance because a user sent it over a network or the Internet, or carried it on a removable medium such as a floppy disk, CD, DVD, or USB drive. Viruses can increase their chances of spreading to other computers by infecting files on a network file system or a file system that is accessed by another computer. As shown above, the term “computer virus” is sometimes used as a catch-all phrase to include all types of malware, even those that do not have the reproductive ability. Malware includes computer viruses, computer worms, Trojan horses, rootkits, spyware, dishonest adware and other malicious and unwanted software, including true viruses. 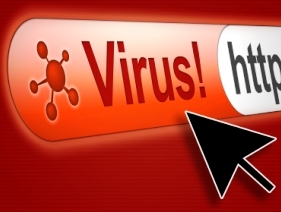 Viruses are sometimes confused with worms and Trojan horses, which are technically different. A worm can exploit security vulnerabilities to spread itself automatically to other computers through networks, while a Trojan horse is a program that appears harmless but hides malicious functions. Worms and Trojan horses, like viruses, may harm a computer data or performance. Some viruses and other malware have symptoms noticeable to the computer user, but many are surreptitious or simply do nothing to call attention to themselves. Some viruses do nothing beyond reproducing themselves. Malware, short for malicious software, consists of programming (code, scripts, active content, and other software) designed to disrupt or deny operation, gather information that leads to loss of privacy or exploitation, gain unauthorized access to system resources, and other abusive behavior. The expression is a general term used by computer professionals to mean a variety of forms of hostile, intrusive, or annoying software or program code. The prevalence of malware as a vehicle for organized Internet crime, along with the general inability of traditional anti-malware protection platforms (products) to protect against the continuous stream of unique and newly produced malware, has seen the adoption of a new mindset for businesses operating on the Internet: the acknowledgment that some sizable percentage of Internet customers will always be infected for some reason or another, and that they need to continue doing business with infected customers. Spyware is a type of malware that can be installed on computers, and which collects small pieces of information about users without their knowledge. The presence of spyware is typically hidden from the user, and can be difficult to detect. Typically, spyware is secretly installed on the user’s personal computer. Sometimes, however, spywares such as keyloggers are installed by the owner of a shared, corporate, or public computer on purpose in order to secretly monitor other users. While the term spyware suggests software that secretly monitors the user’s computing, the functions of spyware extend well beyond simple monitoring. Spyware programs can collect various types of personal information, such as Internet surfing habits and sites that have been visited, but can also interfere with user control of the computer in other ways, such as installing additional software and redirecting Web browser activity. Spyware is known to change computer settings, resulting in slow connection speeds, different home pages, and/or loss of Internet connection or functionality of other programs. In an attempt to increase the understanding of spyware, a more formal classification of its included software types is provided by the term privacy-invasive software. Adware, or advertising-supported software, is any software package which automatically plays, displays, or downloads advertisements to a computer. These advertisements can be in the form of a pop-up. They may also be in the user interface of the software or on a screen presented to the user during the installation process. The object of the Adware is to generate revenue for its author. Adware, by itself, is harmless; however, some adware may come with integrated spyware such as keyloggers and other privacy-invasive software. Advertising functions are integrated into or bundled with the software, which is often designed to note what Internet sites the user visits and to present advertising pertinent to the types of goods or services featured there. Adware is usually seen by the developer as a way to recover development costs, and in some cases it may allow the software to be provided to the user free of charge or at a reduced price. The income derived from presenting advertisements to the user may allow or motivate the developer to continue to develop, maintain and upgrade the software product. Conversely, the advertisements may be seen by the user as interruptions or annoyances, or as distractions from the task at hand. Some adware is also shareware, and so the word may be used as term of distinction to differentiate between types of shareware software. What differentiates adware from other shareware is that it is primarily advertising-supported. Users may also be given the option to pay for a “registered” or “licensed” copy to do away with the advertisements. Virus, Malware, Spyware and Adware Removal specialists.